This past winter was pretty brutal with not only living in the snowiest city in the country, but having below freezing temperatures as well. It wasn’t very conducive to being outdoors or leaving the house at all. There were a few weeks where I went to church on Sunday morning, and I didn’t leave the house again until the following Sunday. When you have a young baby, it just didn’t make much sense to risk our lives by driving somewhere without a really good reason. I figured if we died on the way to church, then it was really in God’s plan, right? Since we live in the middle of the woods we don’t get too many visitors, so for about 3 straight months, it was just Big Guy, Kona, and me cooped up in our little 2-bedroom bungalow carriage house above our garage. And people wonder why he’s “such a mommy’s boy”… I’d be concerned if he wasn’t! Anyways, Big Guy was super content playing independently on the floor but not yet mobile, so I was able to do some fun DIY projects like make my own baby leggings and make some fun artwork for his room. Since we moved in just two months before he was born, I didn’t really have it decorated much but my goal has been to have it finished by his first birthday. Well that’s less than a month away, so we shall see if I make my goal or not. I envisioned real deer antlers as part of a collage over his floor bed, but hadn’t come across any so I figured I might as well make my own deer head. Why not, right? I followed excellent tutorials by lil blue boo and bhg, but kind of combined them to come up with my own version. First, we don’t get the newspaper but we do get those annoying magazine mailings, so I crumpled up a bunch to form large, medium, and small balls. I placed the small on top the medium, and the medium on top the large, to form what I thought somewhat resembled a deer head. Then I taped them all in place. You could also tape each ball, and then tape the three balls together if you prefer. 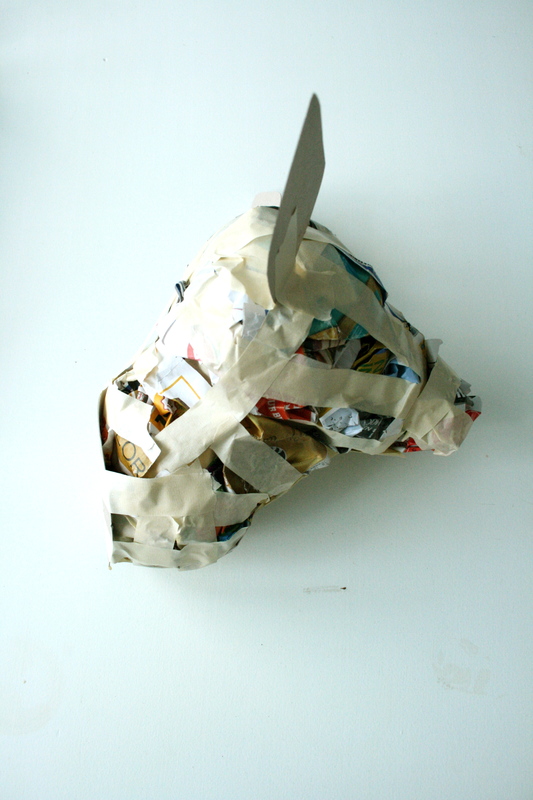 Next, I crumpled up a bunch more to form the deer neck and taped it to the deer head. At this point, I also cut out an oval shape on thin cardboard and taped it to the bottom of the neck so I would have something solid to adhere the mount to when finished, and it would help give it a finished off look at the end. Then, on that same piece of thin cardboard, I cut out little ears and taped them to the deer head. 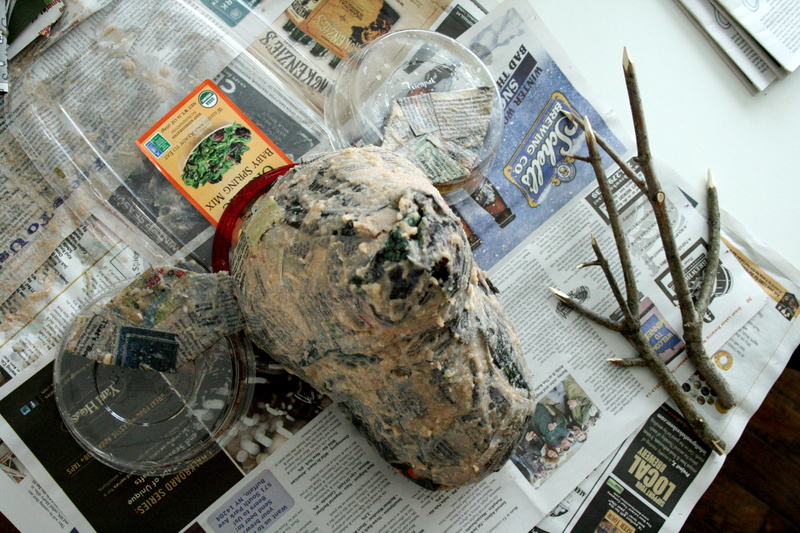 Now comes the really fun part – paper mache! I made my own mixture of 1 part flour to 4 parts water. I let it come to a boil, stirring constantly, until it was soupy. I then transfered it to a bowl to cool just enough for me to be able to touch it. I must admit here, all I had on hand was organic sprouted whole wheat flour. Note to self: buy some white flour for arts-n-crafts. The “healthy mixture” was grainy and took a long time to dry. I ended up coming across a couple newspaper type mailings so I cut them up, dipped them in the mixture, and applied them all over the deer head until it was completely covered. I set it up to dry on ready-to-be-recycled plastic containers to keep it from sticking to the newspaper. It should only take one night to dry. My “healthy mixture” took a couple days. My mother gave me the brilliant idea of using some old piano sheet music as my final covering. I cut up a bunch of pieces, used a foam brush to slather on some mod podge to both sides of the paper, applied them all over the form, and let set to dry. This is what it looked like after drying. While this was going on, or probably while I was waiting for my “healthy mixture” to dry, my husband went out to our brush pile, found some twigs to cut, and made some antlers for me. Then we drilled two holes in the top of the form near the ears where antlers would normally be and inserted the twig antlers in the holes. You could put super glue inside first if you wanted, but our holes were small enough that the twigs didn’t move much once inserted. I picked up this pre-cut wood plaque at Hobby Lobby for like $3.00 and then spray painted it turquoise. We could have then just stapled the form onto the plaque but my husband insisted in drilling screws through the back of the plaque into the form to make it hold. Regardless, this was the outcome! When I finally finish decorating Big Guy’s room, I promise I’ll share photos of the entire collage. For now, this bad boy is taking up all the attention on the wall!